Are you facing adversity and needs encouragement? Jeremiah 29:11 reminds us that no matter what we are going through there is no need to worry because our God has A GOOD PLAN in our lives. His plans for our life is so much better than our own. When we begin to follow His plan for our lives we will have peace and hope. 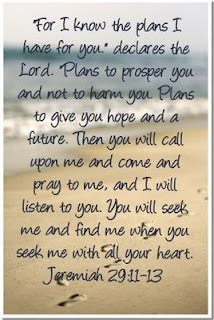 He promises that if we will seek and pray with all of our hearts, He WILL listen. He promises that if we will draw near to Him He WILL draw near to us. Following his plan and path for our life, will lead to an abundant life, a life of full hope, peace, and security.